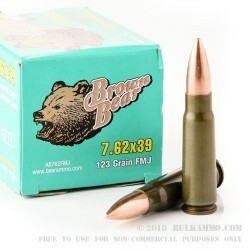 Ideal for any AK or SKS rifle, this Brown Bear ammunition offers all the value of surplus ammunition without the nasty corrosive primers. Each cartridge fires a 123 grain bimetal FMJ bullet at 2401 feet per second. Each case contains 500 rounds, cased in lacquer-coated, non-reloadable steel with non-corrosive Berdan primers. Brown Bear is the brand name of the Barnaul Machine Plant, a major ammunition factory in Barnaul, Russia. The company dates back to the era of the czars. Founded in St. Petersburg in 1869, it moved to Moscow after Russia's exit from World War I and was evacuated to Barnaul as the Nazis approached Moscow during World War II. A month after the move, the plant made its first shipment to the Soviet military. By the end of the war, 50% of the cartridges used by Soviet soldiers were Barnaul-made, a significant contribution to the Allied victory against the Nazis. Today, the Barnaul plant continues to produce ammunition, particularly shotgun and rifle cartridges. Review by One happy customer.. I placed my order with BULKAMMO.COM on Monday afternoon, after shopping online for the lowest price. I wasn't even thinking about my order on Thursday, when to my surprise I heard a UPS truck stop in front of my house. Now I'm not ashamed to admit, that I get excited waiting see if the driver is going to walk towards my house. And sure as heck, the driver was walking my way. Lol ofcourse this ammo was dirty. BUT she ate this ammo up and spit it out. Thanks bulk ammo great price fast delivery. I had with my purchase. Q: Are these lead rounds, or steel. Thanks. A: Hello Scott! 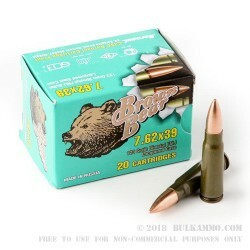 This Brown Bear ammunition is loaded with a lead core, bi-metal jacketed projectile. As a result, the jacket does contain steel and will not pass any type of magnet test. A: Hello Jordan, This ammunition is loaded in Non-reloadable steel cases. 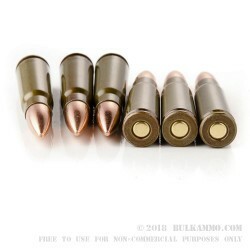 Q: Are these 7.62x39mm Ammo by Brown Bear - Polymer Coated - 123gr FMJ rounds lead core or steel core? A: Hello Marc, These 123gr. FMJ rounds by Brown Bear in 7.62x39 have a lead core, but they do have a steel case which will attract a magnet. The best bet for ranges that do not allow magnetic rounds are brass cased rounds which do not attract a magnet.